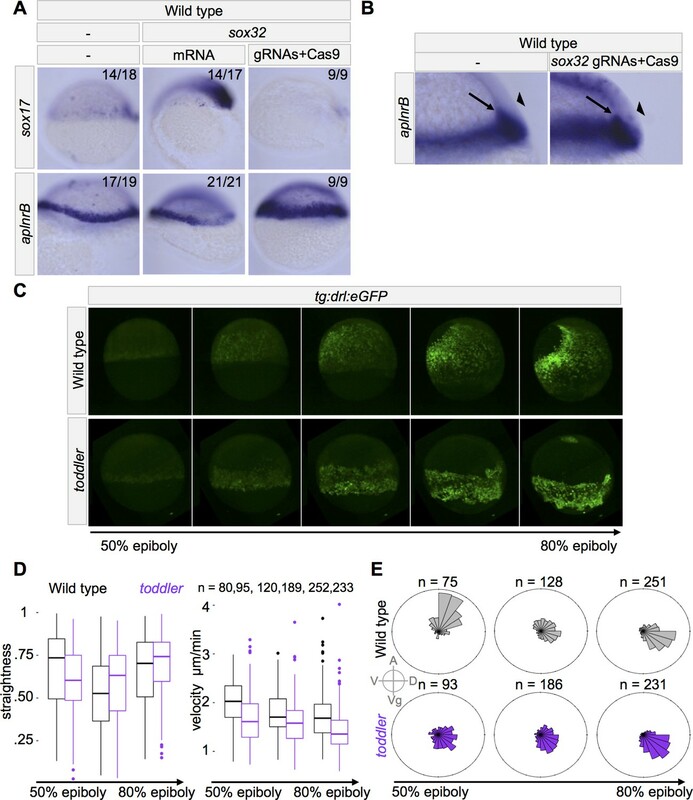 Toddler/Apela/Elabela is a conserved secreted peptide that regulates mesendoderm development during zebrafish gastrulation. Two non-exclusive models have been proposed to explain Toddler function. The ‘specification model’ postulates that Toddler signaling enhances Nodal signaling to properly specify endoderm, whereas the ‘migration model’ posits that Toddler signaling regulates mesendodermal cell migration downstream of Nodal signaling. Here, we test key predictions of both models. We find that in toddler mutants Nodal signaling is initially normal and increasing endoderm specification does not rescue mesendodermal cell migration. Mesodermal cell migration defects in toddler mutants result from a decrease in animal pole-directed migration and are independent of endoderm. Conversely, endodermal cell migration defects are dependent on a Cxcr4a-regulated tether of the endoderm to mesoderm. These results suggest that Toddler signaling regulates mesodermal cell migration downstream of Nodal signaling and indirectly affects endodermal cell migration via Cxcr4a-signaling. Gastrulation is a conserved process in embryogenesis during which the three germ layers – endoderm, mesoderm and ectoderm – undergo large-scale rearrangements to shape the embryo (Solnica-Krezel, 2005; Schier, 2009; Langdon and Mullins, 2011; Solnica-Krezel and Sepich, 2012). Following their specification, endoderm and mesoderm (jointly referred to as mesendoderm) internalize beneath the ectoderm and migrate away from the site of internalization. The germ layers then converge to the dorsal side of the embryo, narrowing and extending the axis. Defects in these cellular movements can lead to a truncated body axis and abnormal organs, while defects in initial specification cause absence or reduction of mesendoderm derivatives (Solnica-Krezel, 2005; Schier, 2009; Langdon and Mullins, 2011; Solnica-Krezel and Sepich, 2012). Germ layer specification and migration are regulated by conserved signaling pathways. Endoderm and mesoderm specification depends on the TGFβ-ligand Nodal. Secreted Nodal ligands bind to Activin receptors, which leads to Smad2 phosphorylation and target gene induction (Schier, 2009). Nodal signals also trigger transcription of their own inhibitors, which belong to the Lefty family. Thus, lefty mutants have increased Nodal signaling resulting in increased endodermal and mesodermal gene expression and cell number during gastrulation (Meno et al., 1999; Rogers et al., unpublished ). After specification by Nodal, endodermal cells are tethered to mesodermal cells through a fibronectin-integrin link genetically regulated by the GPCR Cxcr4a (Mizoguchi et al., 2008; Nair and Schilling, 2008). Loss of Cxcr4a releases this tether and results in excessive animal pole-directed migration of endodermal cells, while mesodermal cell migration is unaffected (Mizoguchi et al., 2008; Nair and Schilling, 2008). An additional GPCR pathway, regulated by Toddler/Apela/Elabela, is also required for proper endoderm and mesoderm formation and migration (Chng et al., 2013; Pauli et al., 2014). In this pathway, the secreted peptide Toddler, which is highly conserved throughout vertebrates, signals via the GPCR APJ (in zebrafish: Apelin receptor A and B, jointly referred to as Apelin receptor). In toddler mutants, initial specification of endoderm and mesoderm is normal (Pauli et al., 2014), but by mid-gastrulation, toddler mutants have fewer endodermal cells and mesendodermal cell migration is reduced (Chng et al., 2013; Pauli et al., 2014). toddler mutants generally die around 7 days post fertilization (dpf) with deformed hearts, blood accumulation, edema and endodermal abnormalities (Chng et al., 2013; Pauli et al., 2014). Two non-exclusive models have been proposed for the role of Toddler signaling in gastrulation. One model, the ‘specification model’, postulates that Toddler’s primary role is to promote the specification of endoderm, which when defective leads to abnormal migration of mesendodermal cells (Chng et al., 2013). This model is supported by the observation of fewer endodermal cells in toddler mutants. Moreover, Apelin receptor signaling has been proposed to enhance Nodal signaling, possibly accounting for the endoderm cell number defects in toddler mutants (Deshwar et al., 2016). Based on these findings, it has been proposed that Toddler signaling enhances Nodal signaling, allowing for proper endoderm specification, which in turn promotes mesendodermal cell migration. An alternative model for Toddler signaling, the ‘migration model’, postulates that the primary role of Toddler signaling is to regulate mesendodermal cell migration. This model is supported by the observation that mesendodermal cells migrate more slowly during internalization in toddler mutants, and that apelin receptor a and b gene expression depend on Nodal signaling (Tucker et al., 2007; Pauli et al., 2014). These findings place Toddler signaling downstream of Nodal signaling and endoderm specification and suggest a primary role for Toddler signaling in mesendodermal cell migration. To clarify how Toddler regulates gastrulation, we tested four aspects of the specification and migration models. First, we determined if the defects in toddler mutants result primarily from reduced endoderm specification. Second, we analyzed if toddler mutants display reduced Nodal signaling. Third, we examined how migration of mesodermal cells is affected in toddler mutants. Fourth, we tested if Toddler’s primary site of action is endoderm, mesoderm, or both cell types. We found that reduced endoderm specification is not sufficient to explain the toddler mutant phenotype, that Nodal signaling initiates normally in toddler mutants, and that Toddler signaling acts on mesodermal cells to allow animal pole-directed migration. Our results support a modified version of the migration model in which Toddler signaling acts downstream of Nodal signaling to regulate mesodermal cell migration while indirectly regulating endodermal cell migration via Cxcr4a signaling. In toddler mutants, endoderm initially appears normal (Pauli et al., 2014), but by mid-gastrulation, the number of endodermal cells is reduced (Figure 1A–B)(Chng et al., 2013; Pauli et al., 2014). Since Toddler has been implicated in endodermal specification (Chng et al., 2013; Ho et al., 2015), we revisited the cause of reduced endodermal cell numbers in toddler mutants. We found that endodermal cell numbers are comparable between wild-type and toddler mutant embryos at 60% epiboly and that they go on to divide at similar rates, suggesting that initial specification and subsequent proliferation are not affected (Figure 1—figure supplement 1)(Pauli et al., 2014). Instead, we found increased rates of cell death in toddler mutant embryos, including endodermal cell death, which may account for the decreased cell numbers observed during later gastrulation (Figure 1—figure supplement 1). Increased endodermal specification does not rescue endodermal cell migration in toddler;lefty2 double mutants. (A) Representative images of embryos analyzed in B and D. In situ hybridization with a sox17 probe at 75% epiboly; dorsal to the right. Endoderm in toddler;lefty2 double mutants resembles toddler single mutants. (B) The number of lateral endodermal cells is increased in toddler;lefty2 double mutants compared to wild-type and toddler single mutant embryos. Each point represents a single embryo. Red bars are averages. p-Values for pairwise comparison with wild type unless otherwise noted. **p<0.001; unpaired two-tailed t-test. N = number of independent experiments; n = number of embryos. (C) Schematic representation of experimental measurements shown in B and D. The locations of lateral endodermal cells in individual embryos are measured relative to the AP-VP axis and then consolidated across embryos. (D) Measurement of frequency with which cells were found at a given location in an embryo of a certain genotype. A cell at the animal pole corresponds to 100% embryo height, while a cell at the vegetal pole corresponds to 0%. AP = Animal pole; VP = vegetal pole. The same embryos were measured in B and D.
If the deficit in endodermal cells is the primary defect in toddler mutants, increasing endodermal cell number might rescue other aspects of the toddler mutant phenotype. To increase endodermal cell number, we used lefty2 mutants, which have more endodermal cells due to increased Nodal signaling (Figure 1A–B)(Meno et al., 1999; Agathon et al., 2001; Rogers et al., ). We analyzed endoderm specification and mesendodermal cell dispersion in toddler;lefty2 double mutants and compared it to toddler and lefty2 single mutants and wild-type embryos (Figures 1 and 2). As expected, lefty2 single and toddler;lefty2 double mutant embryos had more endodermal cells than toddler single mutants and wild-type embryos (Figure 1A–B). While endodermal cells in lefty2 single mutants migrated normally, endodermal cell dispersion in toddler;lefty2 double mutants was not rescued and resembled toddler single mutant siblings (Figure 1A,C and D). As with endoderm, mesodermal cell dispersion was not rescued in toddler;lefty2 double mutants (Figure 2A–B). Thus, increasing endodermal cell number did not rescue the endodermal or mesodermal cell migration defects in toddler mutants. Mesodermal cell migration and larval phenotypes are not rescued by increased numbers of endodermal cells. (A) Schematic representation of experimental measurements shown in B. Densely packed, fn1a + lateral mesodermal cells are viewed by cross section. Location of the most animally migrated lateral cells of individual embryos are measured relative to AP-VP axis, then consolidated across embryos. AP = Animal pole; VP = vegetal pole. (B) Defects in animal-pole directed migration of mesodermal cells are still present in toddler;lefty2 double mutants. Each point represents a single embryo. Red bars are averages. p-Values for pairwise comparison with wild type unless indicated otherwise. *p=0.04, **p<0.001; ns: p=0.08; unpaired two-tailed t-test. (C–D) toddler;lefty2 double mutants resemble toddler single mutant siblings in respect to heart phenotypes at 2 days post fertilization (dpf). Hearts were classified as small if shortened by more than half of normal length and/or excessively narrow or thin. Hearts that were neither thin nor short but appeared to have looping defects or other patterning defects were classified as normal. Heart phenotypes were scored blind to genotype for toddler and toddler;lefty2 mutants. (C) Representative images of phenotypic classes after in situ hybridization for myl7. (D) Quantification of C. (E–F) toddler;lefty2 double mutants are more poorly patterned than toddler single mutant siblings in respect to tail phenotypes at 3 dpf. (E) Representative images of phenotypic classes. Phenotype classes II-V lack circulation. Arrow: accumulated blood. Arrowhead: defects in mesenchyme. * Duplicated tail tip. (F) Quantification of E. (B,D,F) N = number of independent experiments; n = number of embryos. To test if increased endodermal cell number can rescue later phenotypes found in toddler mutants, we analyzed embryo morphology and heart size in 2- to 3-day-old toddler;lefty2 double mutants. Hearts in toddler;lefty2 double mutants resembled toddler single mutants, except in rare cases when hearts were wild-type in size (Figure 2C–D). 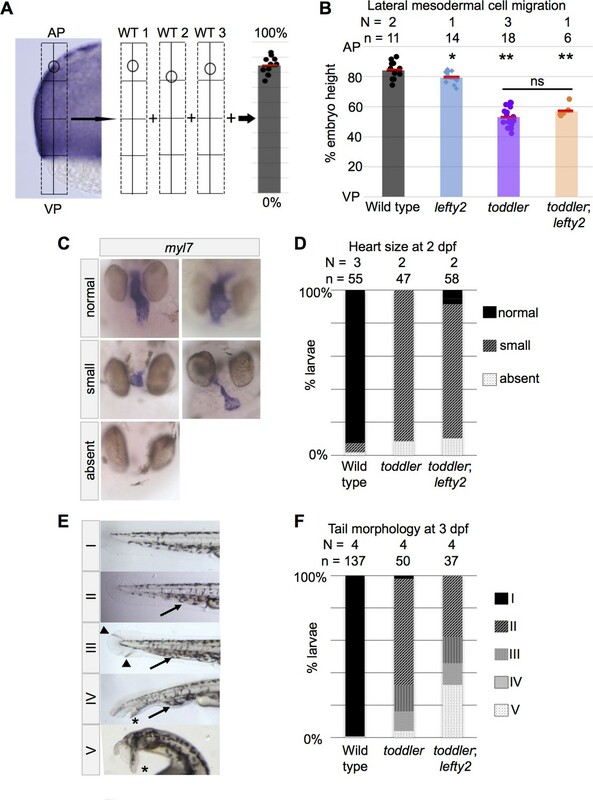 By 3 dpf, toddler;lefty2 double mutant larvae had similar or more severe patterning defects as compared to their toddler single mutant siblings (Figure 2E–F). Taken together, these results indicate that increasing endoderm cell number cannot rescue toddler mutant phenotypes. First, we used in situ hybridization to examine expression of two direct Nodal target genes, lefty1 and lefty2, just before gastrulation and found no difference between wild-type and toddler mutant embryos (Figure 3A). Similarly, apelin receptor a and b single and double mutants also displayed normal expression of the Nodal target genes lefty1 and lefty2 (Figure 3B–C). Wild-type and toddler mutant embryos have similar levels of Nodal signaling. 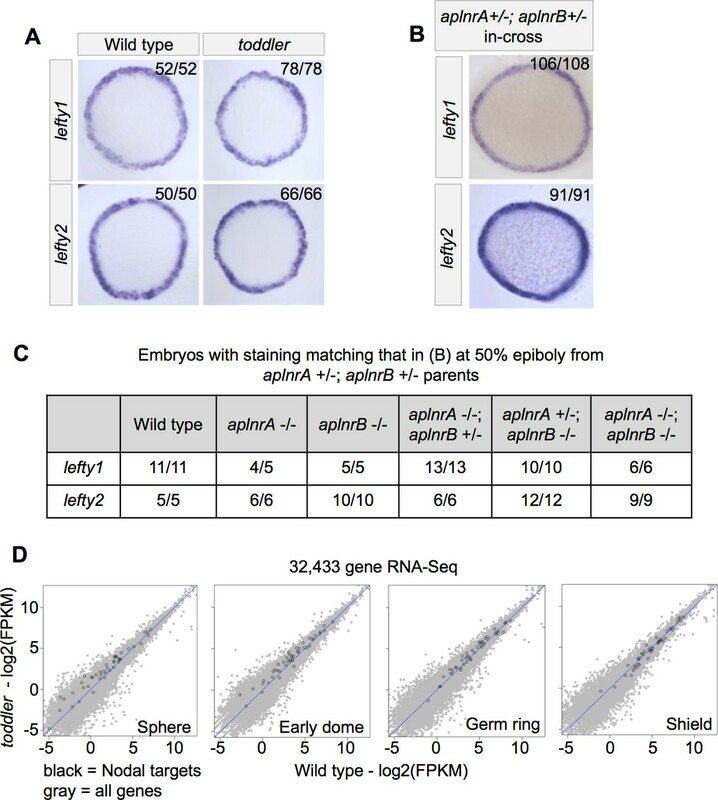 (A) Representative images of Nodal target gene expression in wild-type and toddler mutant embryos based on in situ hybridization at 50% epiboly. Animal pole facing up. Three biological replicates. (B–C) aplnrA;aplnrB double heterozygote parents were incrossed and their progeny examined by in situ hybridization at 50% epiboly. (B) Representative images of Nodal target gene expression in offspring from aplnrA;aplnrB double heterozygote parents. Animal pole facing up. (C) All embryos from B were genotyped. Results for relevant genotypes are shown. Expression of lefty1 and lefty2 in aplnrA;aplnrB double mutant embryos was indistinguishable from wild type. (D) RNA-sequencing before and during early gastrulation reveals no differential transcription of Nodal targets (black dots) between wild-type and toddler mutant embryos. All other genes are shaded in light gray. See also Figure 3—Source data 1. Second, we analyzed Nodal target gene expression by RNA-Seq at four time points prior to or during early gastrulation in wild-type and toddler mutants. We found no significant differences at any time-point in the expression of Nodal target genes (Dubrulle et al., 2015) or broadly across all genes (Figure 3D)(Figure 3—Source data 1). 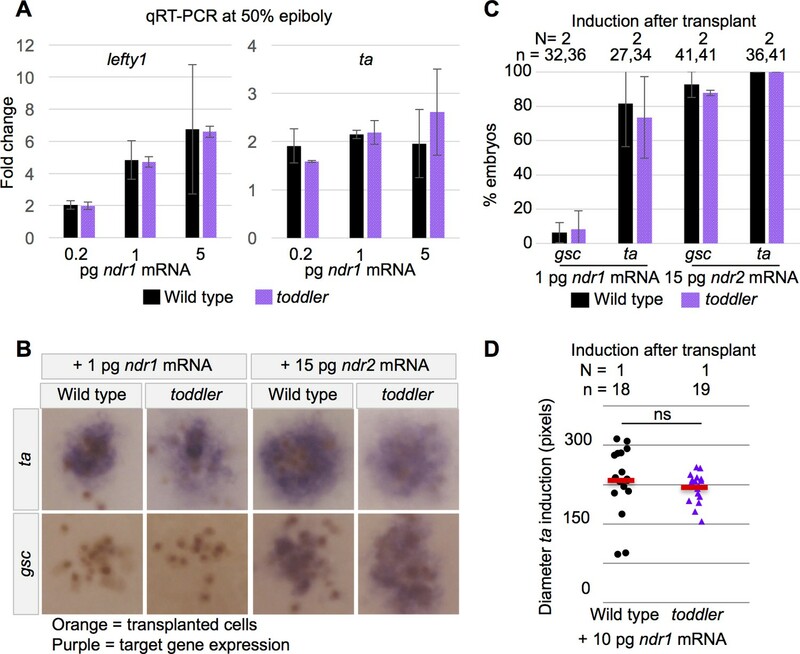 Third, wild-type and toddler mutant embryos were injected at the one cell stage with increasing levels of Nodal mRNA and Nodal target gene expression was measured just prior to gastrulation using qRT-PCR. We found no significant difference in the ability of wild-type and toddler mutants to respond to exogenous Nodal (Figure 4A). Wild-type and toddler mutant embryos respond similarly to exogenous Nodal sources. (A) qRT-PCR at 50% epiboly on embryos injected at the one-cell stage with water or increasing levels of Nodal mRNA. Fold change in expression is relative to water control. Two biological replicates. (B–D) Clones of cells expressing exogenous Nodal mRNA and GFP were transplanted into host embryos at sphere stage and collected for in situ hybridization 1.5 hr later. Donors and hosts were always of matching genotype. (B) Representative images of quantifications in C. Orange staining marks anti-GFP labeled transplanted cells. Purple staining is from in situ hybridization for a Nodal target gene. (C) Percentage of embryos for which Nodal target gene expression was visible via in situ hybridization. N = number of independent experiments. n = number of embryos. (D) Diameter of induction of ta expression around the clone of transplanted cells. Each point represents a single embryo. Red bars are averages; ns: p=0.44; unpaired two-tailed t-test. (A and C) Means ±SEM. Fourth, cells expressing Nodal mRNA were transplanted into a host embryo and the host was assayed for Nodal target gene induction using in situ hybridization (Figure 4B). Wild-type and toddler mutants displayed target gene expression at the same frequencies and across the same distances (Figure 4C–D). These results indicate that the establishment of Nodal signaling is normal in toddler mutants. Toddler signaling has primarily been investigated in the context of endoderm development (Chng et al., 2013; Pauli et al., 2014), but mesoderm also displays migration defects in toddler mutants (Pauli et al., 2014). Furthermore, apelin receptor a and b gene expression in wild-type embryos resembles expression of the mesoderm markers fn1a and fascin, respectively, and is dependent on signaling by the mesendoderm inducer Nodal (Pauli et al., 2014). To further analyze apelin receptor a and b gene expression in endoderm versus mesoderm, we created embryos with excess or diminished levels of endoderm by manipulating the endoderm master regulator sox32 with mRNA injection or CRISPR/Cas9-mediated mutagenesis (Figure 5A–B, Figure 5—figure supplement 5 ) (Kikuchi et al., 2001). As expected, the endodermal marker sox17 displayed increased expression in sox32 mRNA-injected embryos or decreased expression in sox32 mutant embryos (Figure 5A). In contrast, the expression of mesodermal markers fn1a and ta or of apelin receptor a and b increased upon loss of endoderm (Figure 5A and Figure 5—figure supplement 5 ). Furthermore, apelin receptor b expression was retained at the site of internalization in embryos lacking endoderm, suggesting its expression is not ectodermal but mesodermal (Figure 5B). These results indicate that apelin receptor a and b are expressed in mesodermal progenitors. toddler mutant mesodermal cells have diminished animal pole-directed migration during gastrulation. (A–B) Cas9-mediated mutagenesis was used to generate sox32 mutants. Embryos were injected at the one-cell stage either with sox32 mRNA or with Cas9 + sox32 gRNAs. in situ hybridization for sox17 and aplnrB at shield stage; dorsal to the right. (A) Expression of aplnrB decreases in the presence of excess endoderm and increases in the absence of endoderm. (B) Cross-section of shield stage embryo. The majority of cells expressing aplnrB in embryos lacking endoderm are internalized and unlikely to be ectodermal. Arrow: internalized cells. Arrowhead: ectoderm. (C–E) Mesodermal cell migration was tracked during gastrulation using a drl:eGFP transgene and lightsheet microscopy. drl:eGFP labels ventrolateral mesoderm during gastrulation. toddler mutant measurements represent three embryos. Wild-type measurements represent two wild-type and one heterozygous embryos. (C) Representative still frames of maximum intensity projections from a wild-type and toddler mutant drl:eGFP transgenic embryo. See also Video 1. (D–E) Movies spanning 50% to 85% epiboly were aligned at the onset of internalization and binned into 45 min windows. (D) Measurement of straightness and velocity of mesodermal cells in wild-type and toddler mutants. Straightness is defined as the difference between the total movement of a cell in all directions divided by the net displacement (the actual distance between the cell’s beginning and ending location). (E) toddler mutant cells have diminished migration animally during gastrulation. Each bin represents the proportion of cells moving in a given direction weighted by the total distance traveled in that direction. n = number of cells. A = animal, D = dorsal, Vg = vegetal, V = ventral. To determine what aspects of mesodermal cell migration are affected in toddler mutants, we tracked migrating drl:eGFP-positive ventrolateral mesodermal cells (Mosimann et al., 2015) in wild-type and toddler mutant embryos during gastrulation using light sheet microscopy (Figure 5C and Video 1). We found that mesodermal cells moved more slowly in toddler mutants than in wild-type embryos (Figure 5D). In addition, toddler mutant mesodermal cells showed diminished animal pole-directed migration, resulting in persistent vegetal and dorsal-ward migration during gastrulation (Figure 5E). Taken together, these results indicate that Toddler signaling is required for proper animal-pole directed movement of mesodermal cells during gastrulation. Toddler regulates animal-poled directed migration of mesodermal cells. Embryo pair shown in Figure 5C. Embryos are transgenic for drl:eGFP, which labels ventrolateral mesoderm during gastrulation. Embryos are aligned at the onset of internalization. Maximum intensity projections from a light sheet microscope spanning 50% to 85% epiboly, time in hr:min. To test the role of endodermal cells in Toddler’s regulation of mesodermal cell migration, we blocked endoderm specification by mutating sox32 and then analyzed mesoderm dispersion. 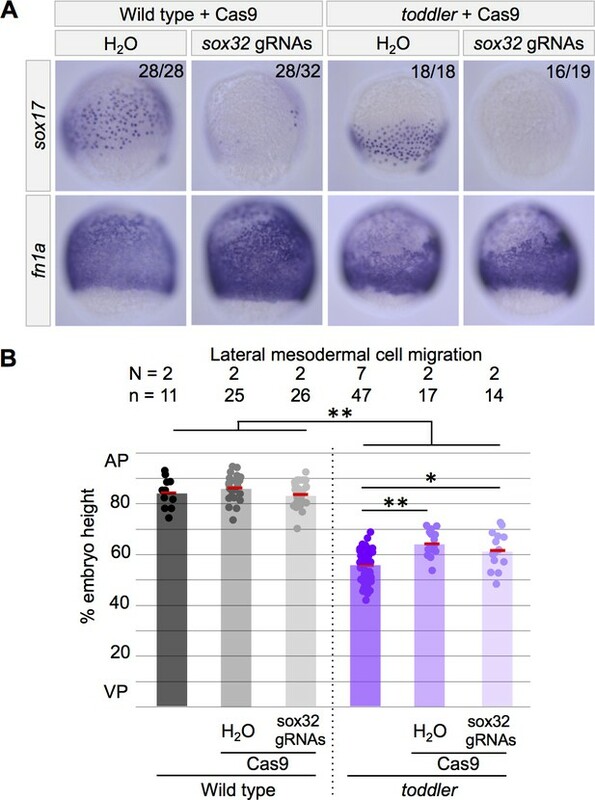 We found that lack of endoderm did not change the normal mesoderm dispersion in wild-type embryos or the reduced migration in toddler mutants (Figure 6A–B). These results indicate that the mesodermal cell migration defects in toddler mutants are independent of endoderm and suggest a direct role of Toddler signaling on mesoderm. Toddler’s role in mesodermal cell migration is independent of endoderm. The presence or absence of endoderm does not affect lateral mesodermal cell migration in wild-type and toddler mutants. Cas9-mediated mutagenesis was used to generate sox32 mutants. Embryos were injected at the one-cell stage with Cas9 and sox32 gRNAs. In situ hybridization for sox17 and fn1a at 75% epiboly; dorsal to the right. (A) Representative images of embryos analyzed in B. (B) Quantification of mesodermal cell migration from embryos in A as described in Figure 2A. AP = Animal pole; VP = vegetal pole. Each point represents a single embryo. Red bars are averages; **p<1.5×10−6; *p<0.05; unpaired two-tailed t-test. During gastrulation, endoderm is physically tethered to mesoderm (Mizoguchi et al., 2008; Nair and Schilling, 2008). Thus, Toddler might act directly upon mesoderm and only indirectly affect endoderm via the tether. To test this hypothesis, we severed the tether linking endodermal cells to mesodermal cells by removing Cxcr4a. We used Cas9-mediated mutagenesis to create a null mutant for cxcr4a (as described in Materials and methods) and observed that mesodermal cells migrated normally (Figure 7A–B), while the most vegetal endodermal cells dispersed further animally than in wild type, consistent with previous Cxcr4a morphant studies (Figure 7C–D) (Mizoguchi et al., 2008; Nair and Schilling, 2008). As expected, mesodermal cell migration in toddler;cxcr4a double mutants was as reduced as in toddler single mutants (Figure 7A–B). Strikingly, however, endoderm dispersion was increased in toddler;cxcr4a double mutants as compared to toddler single mutants (Figure 7C–D). While endoderm migration was increased in toddler;cxcr4a double mutants, the number of endodermal cells did not change (Figure 7E). These observations indicate that the reduced mesodermal cell migration in toddler mutants limits endodermal dispersion and that Toddler signaling is not required for endodermal cell migration per se. Endodermal cell migration does not require Toddler signaling in cxcr4a mutants. (A–B) Analysis of lateral mesodermal cell migration defects in cxcr4a mutant embryos by in situ hybridization for fn1a. Mesodermal cell migration is normal in stable cxcr4a single mutants. toddler;cxcr4a double mutants show mesodermal cell migration defects that resemble toddler single mutant siblings. (C) Representative images of embryos analyzed in D and E. In situ hybridization for sox17 at 75% epiboly; dorsal to the right. Cxcr4a morphants and cxcr4a mutants have excessive animal pole-directed migration of vegetal endoderm. Endoderm patterning in toddler;cxcr4a double mutants resembles wild-type embryos more than toddler single mutant siblings. (D) Measurement of frequency with which cells were found at a given location in an embryo of a certain genotype. A cell at the animal pole corresponds to 100% embryo height, while a cell at the vegetal pole corresponds to 0%. AP = Animal pole=100%; VP = vegetal pole=0%. (E) The number of lateral endodermal cells is unchanged between toddler single and toddler;cxcr4a double mutants. Each point represents a single embryo. Red bars are averages. (B and E) ns: p>0.46; *p<0.05; **p<0.0005; unpaired two-tailed t-test. N = number of independent experiments; n = number of embryos. Here, we clarify the role of Toddler signaling during gastrulation by reporting five main observations. First, increased endoderm specification in toddler;lefty2 double mutants does not alleviate toddler mutant defects (Figures 1 and 2). Second, toddler mutants initiate endogenous Nodal target gene expression normally and respond indistinguishably from wild type to exogenous Nodal sources (Figures 3 and 4). 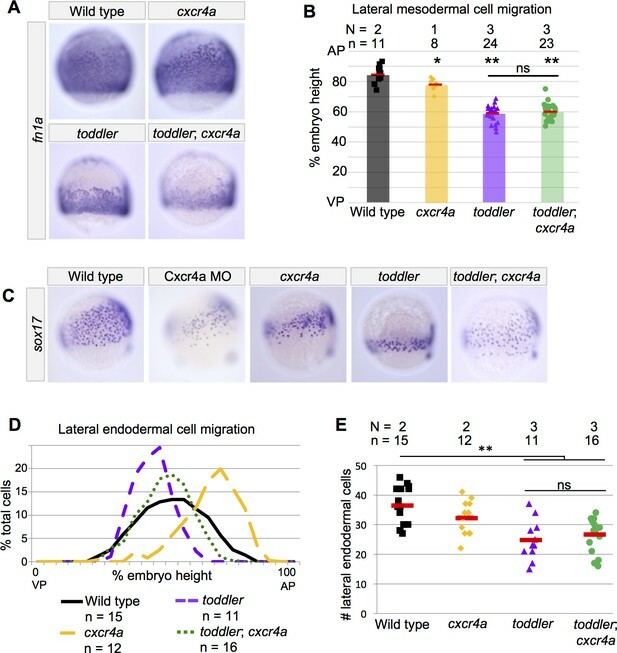 Third, Toddler signaling is required for proper animal pole-directed migration of mesoderm during gastrulation (Figure 5). Fourth, the defects in mesodermal cell migration are independent of endoderm in toddler;sox32 double mutants (Figure 6). Fifth, untethering endodermal and mesodermal cells in toddler;cxcr4a double mutants improves endodermal cell migration without affecting mesoderm (Figure 7). These results and previous studies support the following model for Toddler function. Nodal signaling induces the expression of apelin receptor a and b in mesendodermal cells, rendering them sensitive to Toddler peptide (Figure 5A–B)(Pauli et al., 2014; Tucker et al., 2007). Toddler signaling directly regulates animal-pole directed migration of mesodermal cells (Figures 5 and 6)(Pauli et al., 2014). A Cxcr4a-regulated tether between endodermal and mesodermal cells allows Toddler signaling to indirectly affect endodermal cell migration (Figure 7)(Mizoguchi et al., 2008; Nair and Schilling, 2008). Our findings about Toddler signaling differ from a recent study that concluded Apelin receptor signaling enhances Nodal signaling (Deshwar et al., 2016). Whereas Deshwar and colleagues reported that apelin receptor a and b double morphants appear to have a delayed onset of Nodal signaling, we find that toddler mutants as well as apelin receptor a and b single and double mutants establish Nodal signaling normally (Figure 3). There are multiple possibilities that may explain these different results. First, it is possible that Toddler and/or the Apelin receptors have independent functions (Ho et al., 2015). Second, although apelin receptor mutants and morphants have similar morphological defects (Deshwar et al., 2016), knockdown of the receptors via morpholinos might reveal a phenotype that is masked or compensated in the null mutants (Rossi et al., 2015; Wei et al., 2017). Third, morpholino injection may cause non-specific delayed development or toxicity, as suggested by the epiboly defects seen in apelin receptor a morphants but not apelin receptor a mutants (Ekker and Larson, 2001; Kok et al., 2015; Deshwar et al., 2016). Our study indicates that Toddler is a regulator of mesodermal cell migration and only indirectly regulates endodermal cell migration during gastrulation. Accordingly, we find both similarities and differences in the role of Toddler signaling in the migration of endoderm versus mesoderm. Both endodermal cells (Pauli et al., 2014) and mesodermal cells (this study, Figure 5D) migrate more slowly in the absence of Toddler signaling. However, we find that toddler mutant mesodermal cells have reduced animal pole-directed migration during gastrulation. This is in contrast to endodermal cells, which initially undergo a random walk, including animal pole-directed movement, in wild-type and toddler mutants (Pauli et al., 2014). The intrinsic ability of endoderm to migrate without Toddler signaling is fully revealed in the abundant animal pole-directed migration of endoderm in toddler;cxcr4a double mutants. Thus, the ability to undergo animal pole-directed migration is retained in endodermal cells but compromised in mesodermal cells in the absence of Toddler signaling. These findings raise important questions for future studies. Our work and others have suggested an anti-apoptotic function for Toddler (Ho et al., 2015), raising the question of whether the role for Toddler in cell survival is related to or independent of its role in cell migration? How does Toddler signaling regulate mesodermal cell migration? Our RNA-Seq results in toddler mutants did not reveal major changes in gene expression during gastrulation (Figure 3), suggesting that Toddler’s primary function may be post-transcriptional. The identities of such potential effectors remain unknown. Equally unknown is the nature of the regulators of endodermal cell migration. In the absence of both Toddler and Cxcr4a signaling, endoderm migration is surprisingly normal. What regulates endoderm migration in this background? Toddler signaling will continue to provide an entry point to address these questions. Zebrafish, including TLAB wild-type fish, were maintained according to standard protocols. toddler double mutant lines were obtained by crossing toddler mutants to either lefty1a154, lefty2a146 or cxcr4a mutants. toddler homozygous/lefty1a154 heterozygous, toddler homozygous/lefty2a146 heterozygous and toddler homozygous/cxcr4a heterozygous fish were obtained by injecting 2 pg toddler mRNA at the one cell stage as previously described (Pauli et al., 2014). Embryos were raised at 28°C and staged by morphology unless otherwise noted. lefty1a145 is a null allele harboring a 13 base pair deletion that destroys a PshAI restriction enzyme site (Rogers et al. submitted). lefty2a146 is a null allele harboring an 11 base pair deletion that was genotyped with allele-specific primers (Table 1)(Rogers et al. submitted). aplnrB mutants harbor a 1 bp deletion in the 52nd amino acid, which creates an AflIII restriction enzyme cleavage site. A stable cxcr4a mutant line was generated using Cas9-mediated mutagenesis described below. The cxcr4a mutant line harbors a 433 bp deletion of a 1083 bp long coding sequence, generating a frameshift after the 28th amino acid and was genotyped with allele-specific primers (see Table 1 for gRNAs and primers). toddler mutants and aplnramu296 mutants were genotyped as previously described (Pauli et al., 2014; Helker et al., 2015). See Table 1 for relevant primer sequences. Capped mRNA for sox32 was transcribed from linearized plasmid using the T3 mMessage machine kit from Ambion (Pittsburgh, Pennsylvania). mRNA was injected at the one cell stage. Five gRNAs targeting cxcr4a and nine gRNAs targeting sox32 were designed using ChopChop (Montague et al., 2014) and transcribed as described in Gagnon et al. (2014). The five cxcr4a gRNAs were pooled and injected with Cas9 protein at the one cell stage. Injected embryos were raised to adulthood and monitored for germline transmission by genotyping individual F1 embryos with primers spanning the targeted region of the gene. Nine sox32 gRNAs were pooled and injected with Cas9 protein at the one-cell stage. A subset of embryos were collected for in situ hybridization at shield and 75% epiboly while others were raised to 3 dpf to confirm the expected gross morphological phenotype. See Table 1 for genomic target sequences for gRNAs. Whole mount in situ hybridization was carried out as previously described (Thisse and Thisse, 2008). Stained embryos were imaged in glycerol or were dehydrated in methanol and cleared in BB/BA. Embryos were imaged on an Axio Imager.Z1 microscope. For genotyping after imaging, embryos were washed in water before isolating genomic DNA. Lateral endodermal and mesodermal cells were analyzed in embryos at 70–85% epiboly, except for Figure 1 Supplement, when they were analyzed as early as 60% epiboly. For endoderm, images were analyzed with the lateral side in focus and the dorsal side in the plane of the screen. ImageJ was used to identify the center of the lateral side 90° from dorsal and to measure the absolute height and width of the embryo. The relative locations of sox17+ cells in relationship to embryo height were recorded for all cells falling on or within 10% of the embryo width from the center of the lateral side. The number of cells within this area was used as a proxy for endodermal cell number. For mesoderm, images were analyzed with the dorsal side forward and cross sections of the lateral sides in focus. The relative locations of the most animal fn1a+ cells in relationship to embryo height were recorded. All cell measurements were normalized to percent embryo height before comparison to other embryos. All toddler;lefty2 or toddler;cxcr4a double mutants were compared to their own toddler single mutant siblings. Appropriate numbers of embryos to be analyzed were determined based on robustness of phenotypes across biological replicates and supported by measurements of statistical difference. Wild-type (TLAB) and toddler mutant zebrafish embryos were kept at 28C and staged according to standard procedures. Fifty embryos were collected per genotype per stage (sphere (4 hpf), early dome (5 hpf), germ ring (6 hpf), shield (7 hpf)). Total RNA was isolated using the standard TRIzol (Invitrogen, Waltham, Massachusetts) protocol. Genomic DNA was removed by TURBO-DNase treatment followed by phenol/chloroform extraction. The RNA quality was confirmed using the Agilent 2100 Bioanalyzer. RNAseq libraries were generated using the Illumina TruSeq RNA Library Prep Kit v2. Libraries were sequenced on a HiSeq 2500 (single end 51 bp reads). Reads were aligned using TopHat v2.0.13 (Trapnell et al., 2009) with the following command for each sample ‘tophat -o < output directory> -p 16 --no-novel-juncs -G < gene table><Bowtie2 genome index><fastq reads>”. Transcript abundance and differential expression were determined using Cufflinks v2.2.1 (RRID:SCR_014597)(Trapnell et al., 2012) with the following command for each developmental stage “cuffdiff -p 16 -b < genome.fa -u -L < labels > o<output directory><gene table><wild type aligned reads. bam file><toddler mutant aligned reads. bam file>”. Plots of differential gene expression were generated in Rstudio. The RNA-Seq data set was deposited to GEO; GEO acquisition number GSE89319. Transplantations were carried out using a syringe and a micromanipulator. Donor embryos were injected at the one-cell stage with 50 pg gfp mRNA and a given amount of ndr1 or ndr2 mRNA. 10–20 cells were transplanted at sphere stage from the animal pole of the donor to the animal pole of the uninjected host. All embryos were stage matched and transplantations were homotypic: wild type into wild type or toddler mutant into toddler mutant. Embryos were collected 1.5 hr later at 50% epiboly. Following in situ hybridization for ta or gsc, GFP protein in transplanted cells was probed for using anti-GFP-POD and the VWR DAB reagent set (VWR Catalog number 95059–296, Radnor, Pennsylvania). Embryos were imaged in glycerol. The diameter of induction was measured using ImageJ. When potential differences in phenotype were present experiments were repeated to confirm presence of the differential phenotype across biological replicates. Wild-type and toddler mutants were injected at the one-cell stage with water or increasing amounts of ndr1 mRNA. Embryos were stage matched at the 16 cell stage, collected 4.25 hr later and frozen in liquid nitrogen. Total RNA from 8 to 18 embryos was extracted using Omega E.Z.N.A Total RNA Kit (Norcross, Georgia). cDNA was synthesized using BioRad iScript kit (Hercules, California). qPCR was carried out for technical and biological replicates using GoTaq on a CFX96 machine. 2^-∆∆Ct was calculated for each target gene using actin as a reference. Biological replicates were obtained from separate experimental set-ups. Technical replicates were obtained by splitting biological replicates into two samples after the cDNA prep but before carrying out qPCR. Necessary sample size was determined based on robustness of phenotype and consistency across biological replicates. Gastrulation movements were analyzed by lightsheet microscopy in drl:eGFP (Video 1) and sox17:eGFP transgenic wild-type and toddler mutant embryos. Imaging was performed as outlined in Pauli et al., 2014. In brief, embryos were allowed to develop at 28°C until early dome stage. Within a single experiment, 2–5 embryos (containing at least one embryo of each genotype) were mounted in 1% low-melting point agarose in 1x Danieau’s in glass capillaries (Zeiss, Oberkochen, Germany). Image acquisition was performed at a Lightsheet Z.1 microscope (Zeiss) at 26.5°C in a fish-water-filled imaging chamber. Time-lapse movies of up to five embryos were recorded in the multi-view mode at time-intervals between frames no larger than 180 s.
Timelapse acquisition settings for imaging on the Lightsheet Z.1 (Zeiss) (Single Plane Illumination System): 20x/1.0 water immersion objective, 0.5x zoom; 488 nm laser; Detection: Dual PCO.Edge second-generation sCMOS cameras, liquid cooled, 1920 × 1920 pixels,~70 fps; 16 bit images (1920 × 1920 pixels; 878.8 µm x 878.8 µm; pixel size 0.46 µm); Dual-side illumination with online dual fusion and pivot scan; z-stacks: 80–190 slices per embryo; 1.6–2.5 µm intervals. Manual tracking of sox17:eGFP and drl:eGFP-positive cells was done in FIJI by hand (endoderm) or using TrackMate (mesoderm). For endodermal cells, a window of 20–65 non-dorsal sox17:eGFP+ cells were monitored for cell divisions from the onset of GFP expression to approximately 85% epiboly in three time windows to allow for correction of focus (20 frames, 54 frames, 20 frames, respectively). Intervals between frames was no more than 3.5 min. Percent proliferation was determined by dividing the number of splitting events by the number of cells present at the beginning of the given time window. Proliferation events were averaged over all three time windows for each embryo. For mesodermal cells, embryos were aligned at the beginning of internalization and individual GFP-positive cells were manually tracked until approximately 85% epiboly. Intervals between frames was no more than 3 min. TrackMate data was exported to R for computational analysis. Data from each embryo were binned into four time windows of equal length based on real time. For each measurement, only cells with 5 of more data points per time window were utilized and the entire first time window was excluded from further analysis. Straightness was determined by dividing the total displacement by the total distance. Total displacement was determined by summing the displacement made by a cell during each frame in a time window. Total distance was measured as the distance between the cell’s location in the first and last frame of a time window. Velocity was measured by dividing the total displacement of a cell by the time for each time window. Rose plots were generated by plotting the angle moved weighted by the displacement traveled by each cell for each frame across a time window. Dechorionated embryos were collected at various time points in 4% paraformaldehyde, fixed at 4° overnight, then dehydrated into methanol (similar to collection for in situ hybridization) and stained using the In Situ Cell Death Detection Kit, TMR red, from Sigma Aldrich (St Louis, Missouri). Embryos were mounted in low-melting point agarose and one lateral side of each embryo was imaged using an LSM 880 confocal microscope with a < 1 micron pixel width and <4.5 micron voxel-depth. Maximum intensity projections were analyzed and TUNEL+ cells were defined as a single, large positive spot or multiple, smaller spots in an aggregate. Thank you for submitting your work entitled "Toddler signaling regulates mesodermal cell migration downstream of Nodal signaling" for consideration by eLife. Your article has been reviewed by three peer reviewers, one of whom is a member of our Board of Reviewing Editor, and the evaluation has been overseen by a Senior Editor. The reviewers have opted to remain anonymous. The reviewers all agreed that the function of Toddler in regulating Nodal signalling was an interesting topic. They also acknowledged that it has been controversial and that this manuscript aims to address the two proposed models in a precise and targeted manner. However, the results were found to be currently too preliminary to allow a firm conclusion to be drawn about the precise role of Toddler. This paper addresses an ongoing dispute about the function of the Toddler peptide in controlling mesendodermal development during zebrafish gastrulation. Specifically the disputed question is whether Toddler acts early, to enhance Nodal signaling, and therefore to specify endoderm cells; or, alternatively, whether it acts later, to control the migration of mesendoderm. This elegant paper addresses three predictions that may distinguish the two models. All three sets of experiments lead the authors to conclude that Toddler acts downstream of Nodal signaling to control the migration mesodermal cells and, secondarily, the migration of normally attached endodermal cells. The data are clear, and the conclusions, while quite narrow, appear well supported. That may be slightly different from saying that this paper absolutely settles the case: it is possible that more complex hybrid models would be consistent with all results. The authors discuss the discrepancies with the earlier conclusion that favors the endodermal specification model, and suggest reasons that could account for the distinct conclusions. The manuscript by Norris et al. investigates the mechanism by which the peptide Elabela/Toddler/Apela regulates mesendoderm development. Unlike the zebrafish cardia bifida mutants (cas, mil, fau) that also have reduced mesendoderm and endoderm cell migration defects, or nodal signaling mutants (cyc;sqt or oep) that have mesendoderm specification defects, in toddler mutants Nodal signaling is intact and mesendoderm specification is initially normal. Yet, there is a reduction in endoderm cells by mid-gastrula stages, mesoderm and endoderm cells do not migrate correctly, and toddler mutants have very small or no hearts. 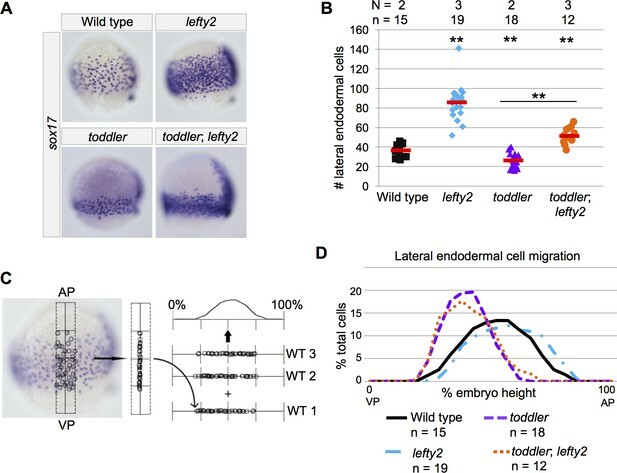 Using loss of lefty inhibitor to increase nodal signalling (and endoderm specification) in the context of toddler mutants, the authors tested and rule out the "specification model" which proposed a role for toddler as an enhancer of Nodal signaling. This part of the manuscript is, for the most part, nicely done. Norris and coworkers then tested the "migration model" by loss of the GPCR/chemokine receptor, cxcr4a and suggest that Toddler indirectly affects endoderm migration via Cxcr4 signaling. This part of the manuscript is not very convincing: the tether postulate can only partially explain the cell migration defect (in the endoderm), and it is unclear how mesoderm migration is affected in toddler mutants. In addition, why are endoderm cell numbers reduced? Do these cells die or is there delayed/other cell division defects in the mutant mesendoderm? Are the authors certain that initial mesendoderm specification is normal in toddler mutants? Norris and coworkers show that response to Nodal signalling is intact in toddler embryos, however both the Reversade and Schier groups have previously shown that in toddler mutants, the scl and gata5 expression domains are expanded. How can this be explained? If the primary function for toddler is in regulation of cell migration, it might be useful to investigate individual cell behaviours, rather than exclusively rely upon the expression of germ layer markers. For instance, is protrusive activity altered in mutant cells (which might then affect cell migration)? Are there defects in cytoskeletal organization in toddler mutant mesendoderm, which might affect cell division and cell numbers as well as cell migration? The authors examined RNAseq data and conclude that the gene expression profile is largely unchanged in toddler mutant embryos compared to controls, at least at early embryonic stages (sphere-shield). However, for abundant molecules (such as those comprising the cytoskeleton) and for those that have a significant maternal contribution, the subcellular distribution of the proteins might be important, but may not be evident from absolute transcript levels. In summary, the manuscript has some novel findings; the data ruling out effects of Toddler on mesendoderm specification via Nodal signaling is interesting and contrasts with a recent report by the Reversade and Scott groups. However, the manuscript does not satisfactorily address how Toddler affects cell migration (especially the mesoderm). In its present form, the manuscript seems more appropriate for a specialized audience. This paper seeks to distinguish between two models for Toddler function in zebrafish embryos. One model suggests that Toddler is required for Nodal signalling and thus is required to correctly specify endoderm. The other model postulates that Toddler regulates mesendodermal cell migration downstream of Nodal signaling. The authors' data do not support the first model, but give some support to the second model. However, in general, I think that the work is preliminary, and key controls are missing in my view. There is also no insight into how Toddler could be functioning to promote mesodermal cell migration. 1) In Figures 1 and 2, the authors compare the toddler mutant and the lefty2;toddler double mutant, without showing data for the lefty2 mutant alone. This must be shown in order to be able to assess the effect of mutating toddler in the lefty2 mutant background. 2) In Figure 2C, the heart sizes should be quantitated. It is not sufficient to present the percentage of embryos with smaller hearts. 3) In general I think the images showing sox17 staining to quantitate numbers of endodermal cells are low in quality. It would be better to perform fluorescent in situs, which would be easier to image and quantitate. 4) The loss of function experiments for sox32 have been performed using transient expression of guide RNAs and Cas9. There are no controls showing that sox32 has been deleted. The authors must prove what deletions they are achieving in these embryos and they must prove the loss of sox32. It would be much better if they used a stable line as they have for the cxcr4a mutant. 5) There is no evidence presented that the lefty2 mutants or the cxcr4a mutants are nulls. 6) The authors say that loss of sox32 or overexpression of sox32 has no effect on aplnrB expression. The data in Figure 5A do not agree with this. There is certainly lower expression when sox32 is overexpressed, and higher expression when sox32 is deleted. In addition, what is the anterior staining in Figure 5B in the sox32 gRNAs+cas9? In Figure 5—figure supplement 1, sox32 deletion also seems to increase fn1a staining. 6) In Figure 6A, it really is not clear that in the cxcr4a null the sox17 cells migrate further animally. This needs to be investigated further. Thank you for resubmitting your work entitled "Toddler signaling regulates mesodermal cell migration downstream of Nodal signaling" for further consideration at eLife. Your revised article has been favorably evaluated by Marianne Bronner (Senior editor), a Reviewing editor, and three reviewers. 1) It is essential to determine the fate of the missing endodermal cells: is there a change in proliferation or cell death? The authors should use the tools they described in Pauli et al. 2014 to address this key question. 2) It would be helpful to readers to include a more measured and constructive discussion about the differences between the present results and those described by Deshwar et al. Different reagents and approaches were used and it is not clear whether these could account for at least some of the differences. 3) With regard to quantifying the heart size in Figure 2C, the authors argue that it is difficult to do this given the in situ images and the irregular shape of the heart. This may be the case, but it is essential to define what constitutes a small heart. Thus, some level of quantification is required. In response to the helpful suggestions of the reviewers, we have provided additional results concerning the role of Toddler in regulating mesodermal cell migration. From our previous data it was not clear whether directionality, speed, persistence of migration, or aspects of each cause the migration defects observed in toddler mutants. Through live-cell imaging and analysis of mesodermal cells during gastrulation in wild-type and toddler mutant embryos we are now able to conclude that (Abstract): “Mesodermal cell migration defects in toddler mutants result from a decrease in animal pole-directed migration and are independent of endoderm. Conversely, endodermal cell migration defects are dependent on a Cxcr4a-regulated tether to mesoderm”. We address the other questions raised by the reviewers in detail below. We thank the reviewer for her/his strong support. We thank the reviewer for her/his strong support of the part of our study that focuses on Nodal signaling. Norris and coworkers then tested the "migration model" by loss of the GPCR/chemokine receptor, cxcr4a and suggest that Toddler indirectly affects endoderm migration via Cxcr4 signaling. This part of the manuscript is not very convincing: the tether postulate can only partially explain the cell migration defect (in the endoderm), and it is unclear how mesoderm migration is affected in toddler mutants. We agree that it was unclear what aspect of migration, such as directionality, speed, or persistence of migration, caused migration defects. To address this question, we performed live-cell imaging of mesodermal cells during gastrulation in wild-type and toddler mutant embryos (new Figure 5C, D, E, Video 1). Our results reveal that mesodermal cells in toddler mutants migrate more slowly than wild type and have diminished animal-pole directed migration during gastrulation. In addition, why are endoderm cell numbers reduced? Do these cells die or is there delayed/other cell division defects in the mutant mesendoderm? The decreased number of endodermal cells is indeed interesting and perplexing. We have included a paragraph in our discussion to address this remaining question: “The interplay between mesoderm and endoderm might modulate endodermal cell number, as has been suggested in mouse embryonic stem cells (Cheng et al. 2013). This fine-tuning may be disrupted when mesoderm fails to migrate properly. It is also conceivable that Toddler signaling promotes endoderm proliferation during gastrulation. In either case, our results show that increasing endodermal cell number does not rescue migration or other defects in toddler mutants”. Are the authors certain that initial mesendoderm specification is normal in toddler mutants? Norris and coworkers show that response to Nodal signalling is intact in toddler embryos, however both the Reversade and Schier groups have previously shown that in toddler mutants, the scl and gata5 expression domains are expanded. How can this be explained ? The reviewer is correct that Nodal signaling is paramount to proper mesendoderm specification. For this reason we included RNA-sequencing and in situ hybridization data that show normal mesendoderm specification in toddler mutants (Figure 3). We have also previously shown that endoderm (sox17), mesoderm (fn1, ta) and ectoderm (gsc) appear normal during early stages of gastrulation in toddler mutants (Pauli et al. 2014 Suppl Figure S10). Comparatively, scl is ectopically expressed at much later stages, possibly as a secondary defect caused by abnormal gastrulation mutants (Pauli et al. 2014 Figure 2). We are not aware of data that shows that gata5 expression domains are expanded. We agree with the reviewer that the precise mechanism by which Toddler regulates migration is an intriguing question. We have added live-cell imaging of mesodermal cells during gastrulation (Figure 5, Video 1), which shows that Toddler is required for proper migration towards the animal pole as well as proper speed of migration. We do not yet understand the molecular mechanism regulating the directionality and speed changes observed in toddler mutants. A detailed analysis of cytoskeletal changes is difficult for technical reasons. First, there is currently a lack of genetic tools for specifically manipulating mesoderm during gastrulation. Second, there have been many attempts in the past decade to find the downstream target of the Apelin receptors, but each method failed to conclusively identify a well defined pathway (for example Deng et al. 2015; He, Chen, and Li 2016; Paskaradevan and Scott 2012) We hope to address this question in future studies that are beyond the scope of this paper. We thank the reviewer for her/his support and refer her/him to the end of this response, where we discuss in more detail why we believe that eLife is the best forum for this study. In addition, the new mesoderm migration data should make the paper more conclusive. We thank the reviewer for pointing out this inadvertent omission. Data for the lefty2 single mutant has now been added to Figure 1 and 2. This figure was included to compare our results to the Deshwar et al. eLife paper, which used the same analysis. Exact quantification of heart sizes by absolute numbers is difficult based on in situ images and the irregular shape of the heart. But given the clear differences between toddler mutants and wild-type embryos, a more detailed measurement is unlikely to affect the conclusions drawn from this experiment. The reviewer’s concern was likely due to poor resolution of the PDF-converted small figure. We thank the reviewer for asking us to provide additional support for our sox32 loss-of-function experiment. We have included data in Figure 5—figure supplement 1 that shows the high efficacy of injected Cas9 and sox32 gRNAs in mutating the sox32 locus. The phenotype of these Cas9+sox32 gRNA injected embryos matches the known casanova (sox32) mutant phenotype in the complete loss of endoderm (Figure 6A)(Alexander et al. 1999). The lefty2 mutation is a null allele: an 11-nucleotide deletion that results in an out of frame inactive coding sequence. This result will be published in Rogers et al. (in preparation) but we would be happy to share this data with the reviewer. We have also added more information about the cxcr4a mutant. This allele deletes 433 bp of a 1083 bp long coding sequence, rendering the GPCR non-functional. Moreover, the gastrulation phenotype of the homozygous cxcr4a mutant recapitulates the morphant phenotype (Figure 7C) (Mizoguchi et al., 2008; Nair and Schilling, 2008). We apologize for the lack of clarity. We have revised subsection “Toddler receptors are expressed in mesodermal cells” and the legends Figure 5 and Figure 5—figure supplement 1 to say that aplnrB, aplnrA, fn1a and ta decrease slightly or do not change in the presence of excess endoderm and increase in the absence of endoderm. We apologize for the ambiguity in our word choice. We have changed our wording to clarify that the cells that normally reside more vegetally in wild type embryos migrate more animally in the mutants, consistent with previous Cxcr4a morphant studies (Mizoguchi et al., 2008; Nair and Schilling, 2008). We have more closely examined the fate of the missing endodermal cells in toddler mutant embryos (Figure 1—figure supplement 1). We first confirmed that similar numbers of endodermal cells are present at 60% epiboly in wild-type and toddler mutant embryos and that the number of cells increases only in wild type (Figure 1—figure supplement 1A). To investigate a potential proliferation defect in toddler mutant embryos, we tracked division rates of sox17:GFP positive endodermal cells during gastrulation from light sheet movies. We found that wild type and toddler mutant endodermal cells proliferate at the same rate during gastrulation (Figure 1—figure supplement 1B). However, while tracking proliferation, we observed endodermal cells dying in toddler mutants (Figure 1—figure supplement 1E). To determine whether cell death was elevated in toddler mutant embryos, we used TUNEL staining and found that the number of TUNEL+ cells was increased throughout gastrulation in toddler mutants compared to wild-type embryos (Figure 1—figure supplement 1 C,D). Together, this new data suggests that the missing endodermal cells observed at the end of gastrulation (Figure 1B) are not due to initial specification or proliferation defects but instead may result from an increase in cell death in toddler mutants during gastrulation. This is consistent with other work, which observed Toddler had an anti-apoptotic role in human embryonic stem cells (Ho et al. Cell Stem Cell, 2015). We have also updated the text by adding a paragraph that discusses the fate of the missing endodermal cells. We would like to emphasize that, though the decreased endodermal cell number is an interesting phenomenon, it is not the primary role of Toddler signaling. This is demonstrated in Figures 1 and 2, whereby restoring endodermal cell numbers does not abrogate the toddler mutant phenotype. We understand that the use of novel mutants warrants more careful analysis of phenotype and thank the reviewers for the opportunity to better characterize them. The lefty mutants are more completely characterized in a separate paper that we just resubmitted to eLife (Rogers et al.). This paper shows that the allele we study is a null allele and that both Lefty1 and Lefty2 have overlapping roles as inhibitors of Nodal signaling. Antibody staining also shows increased phosphorylation of the Nodal signal transducer, Smad2, in lefty2 mutant embryos as compared to wild-type embryos (Author response image 1)(Dubrulle et al. 2015; Schier 2009). These results, coupled with the increase in Nodal target gene expression (sox17, Figure 1), demonstrate that loss of lefty2 leads to increased Nodal signaling. Nodal signaling is elevated in lefty2 mutants. Smad2 is the intracellular effector of Nodal signaling and is phosphorylated when activated (Schier 2009). We measured phosphorylated Smad2 (pSmad2) by immunostaining as described in a forthcoming manuscript (Rogers et al. submitted). Representative cross-sections from pools of 3-6 embryos at 50% epiboly stage are shown. Left column: nuclei are labeled with Sytox green DNA stain. Middle column: α -pSmad2 immunostaining. Right column: magnified view of embryo margins highlighted in middle column with white boxes. The authors thank Wiebke Herzog for her generous gift of aplnrA mutants. The authors also thank Jeff Farrell and Adam Norris for critical reading of the manuscript and Kathryn Berg for her assistance with TUNEL staining. Animal experimentation: This study adhered to recommendations put forth in the Guide for the Care and Use of Laboratory Animals of the National Institutes of Health. Protocol #25-08 of Harvard University was approved by the Institutional Animal Care and Use Committee (IACUC). © 2017, Norris et al.